Jaq Grantford is an award-winning portrait artist, with work held in the National Gallery of Victoria, and other collections worldwide. Her work is a favourite with gallery goers often winning the People's Choice. She has been recognised by Portrait Society of America a number of times, and many other art prizes throughout Australia and internationally. Her portraits are often quirky and looking at the person from an unusual perspective. But she also works more traditionally, especially with corporate portraits, family portraits, and more personal portraits. essence of who she is. I think that's the real challenge as a portrait artist. And not only for portraits, but for anything else that you are creating. To paint or sculpt something that tells a story about that subject, and conveys to people something of its essence, is just such a joy for me." Jaq Grantford's fine art collection combines cityscapes, surreal oil paintings, drawings and sculpture. Her original paintings are available for sale as well as limited edition prints. Her works have been featured in American Art Collector, and International Artist Magazine and they have won numerous awards, including the Master of Art Competition in London, and the People's Choice in the Black Swan Heritage Prize. Not all works are listed in the shop so please inquire about any pieces that you see and have interest in. 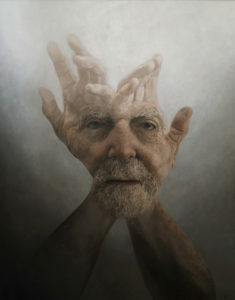 "The human form, in the work of Jaq Grantford, is evanescent and dreamlike: the hands and face form a whole to convey that effort goes hand-in-hand with genius."